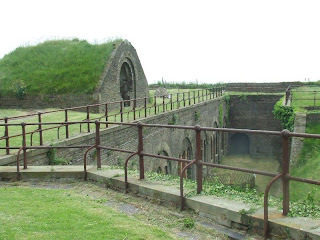 The Drop Redoubt, a detached polygonal structure, is one of the earlier parts of the Western Heights defences. 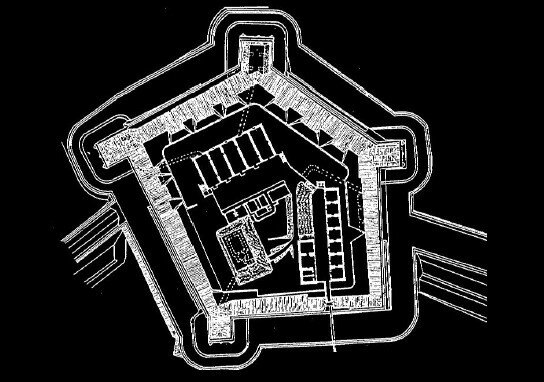 Through the years however, there have been many alterations and modifications including the addition of four caponniers. 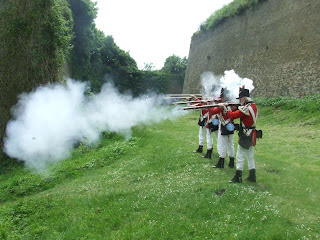 These powerful brick structures project into the ditch to provide carronade and musketry fire down each section of the surrounding dry ditch and are accessed via stairways from the surface of the Redoubt. 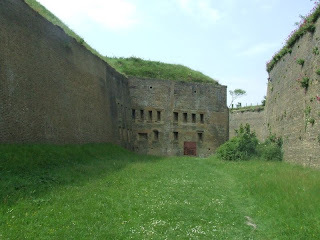 Also on the surface are the remains of large casemates, which were the soldiers' quarters and smaller ones in a gorge close to the main entrance, which were for officers. 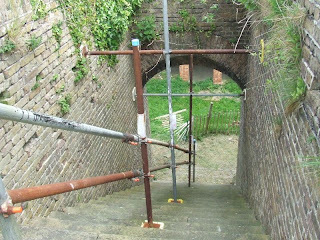 Gun positions still remain on the terreplein, overlooking the town below. 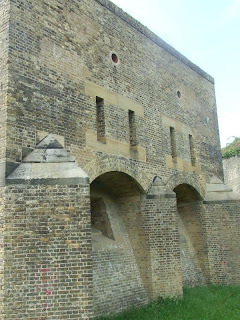 The original form of access to the Redoubt was via a drawbridge at the end of Drop Redoubt Road, but this has now been removed, leaving only a Sallyport in the ditch as the current means of access. 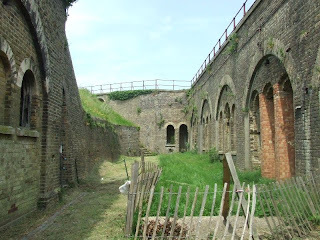 After many years of being left open, the Redoubt has suffered from vandalism, but is now under the care of the Western Heights Preservation Society, of which I am a member. 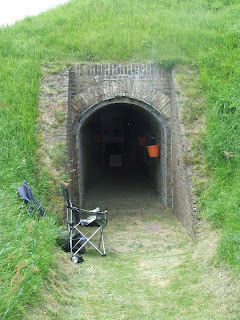 The ditch is open all year round and the interior is opened for two weekends every year, or by guided tour. Hi. What a memory! As a kid in the 60's my parents ran the Crypt Tavern, 10 Bench St, then a Bernie Inn. 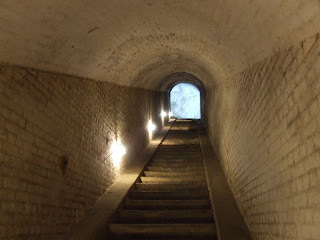 With mates (& very often alone) I would treck up to the Western Heights & scare my self silly. I explored it many times & could surface any where - & wow it was exciting (aged 11). This is the first time I've ever 'seen' many of these rooms I only saw then in the dark. Interesting foot note. 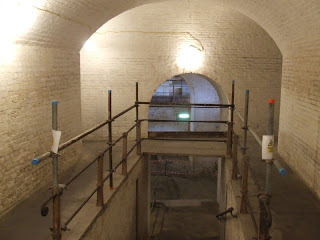 The Crypt Tavern was so called because in its basement was one of the earliest Christian chapels in Britain. 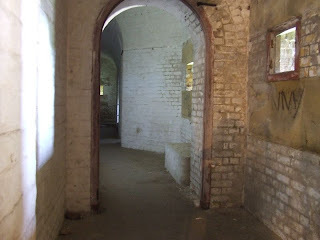 It had been carved out of the chalk & had a small side room with window, where lepers could view the alter. 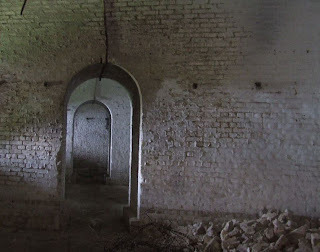 Apparently many died there & it was reputed to be haunted. 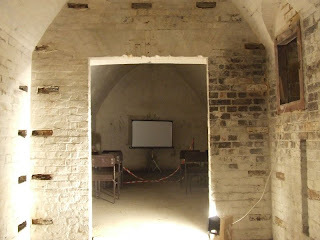 Sadly at both the Crypt & W H's, I never saw or felt anything ghostly. Sorry ghost hunters! 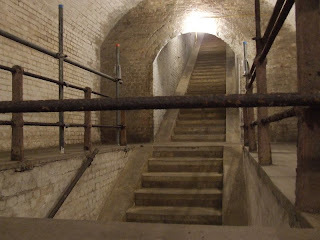 I began work at the Crypt in 1960 when it was owned by John Lukey and sons. Mr and Mrs Grace ran it as a very upmarket restaurant, undoubtedly the best in Dover. H.E.Bates was a regular customer in those days and liked his Aberdeen Angus steak very very well done. I remember seeing a lot of famous faces dine there and have some stories to tell. I was posted to Western Heights Barracks in December 1947 as a L/Cpl in the Corps of Royal Military Police. Together with two others, a Sgt, and a Cpl we were the remains of 193 Provost Company, all the others had gone to Harwich. I was there for eight weeks during which time all my off duty hours were spent exploring the brick built tunnels and underground passages in the Citadel. 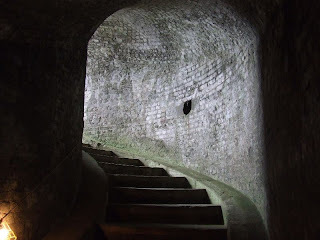 It is the most fascinating building I have ever explored and some of the tunnels go out as far the London Dover road some three miles away and others connect up with the WW2 Channel gun emplacements built into the side of Shakespears Cliff. Wonderful memories. what a waste of our history . its a shame english heritage doesnt do there job instead of ripping our hills to bits which in my eyes they have not got a glue in what they are doing. Yes what memories. I used to play her in the 50's and also was scared playing hide and seek as I seem to remember I was the youngest at about 5 or 6. I now live in New Zealand and it is so nice to see these pictues. 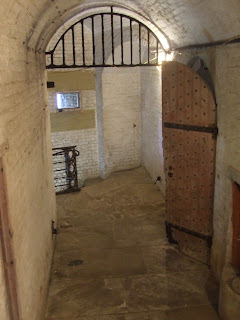 My mother worked at the Crypt for many years with the 'Graces's' and then for the Slatery's when the Graces moved to another restaurant, The halfway house I think it was called and then I believe they moved to Canterbury. My word what memories, also a childhood haunt of mine late 50s early 60s. Good to see that care is taken of the "Moats". Oh and I well remember the Crypt tavern, wasnt it a Bernie inn? We came over here from New Zealand & met someone who told us about Western Heights/drop redout etc. On seeing it we couldn't believe the state of it, this could & should be a major visitors attraction. 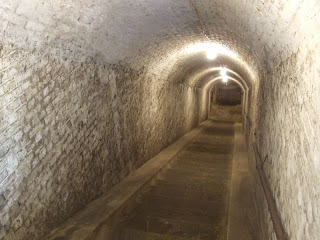 It could be far better than the secret tunnels at Dover Castle. 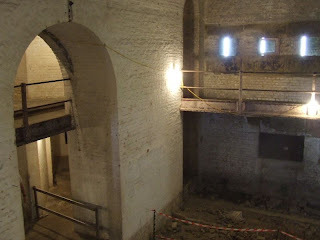 Come on English Heritage do something about the state of this piece of English history. i dont think any thing should be changed about these fascinating buildings, just dont block it off. i lived in dover at the age of 12 to 15 and knew absolutely nothing about the area. i can remember the day we me and my family moved in, while my parents were sorting the last of the house out i took our dog for a walk along hills not knowing at all what i would find,i waked passed the prison looking down at the remarkable architecture being an architect enthusiast i could tell straight away this building was from the early 1800's and on a grand scale.i was amazed as i followed it round in all its wonderful twists and curves i can remember the feelings i got from building and the land, i almost forgot about the the real world feeling my heart race as a turn each corner never knowing what to expect. and then i found it. an entrance a way in, i thought shall i dare enter this amazing slice of history that lay before me, looking up at the sky it was getting late and my tummy was also telling me to go home so i did, but the next morning i was up bright and early with a torch, this time i left the dog at home, when i started school other people would talk about it they called it the smokey. 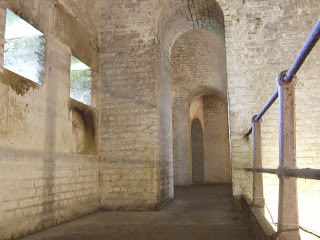 they often spoke about the devils chamber at the back, every one was too scared to go in it. i spent most my time in that building on my own i walked for hours in them and they are very haunted,there were some not nice ones but there were some really nice one i can remember one soldier at the foot well of some stairs i passed him alot and thats how i always knew the way back out and every time i passed him i would say hello and good bye. i hope they do nothing to this place so other generations can form there own memories. This is an amazing site. Really want to have a look inside. 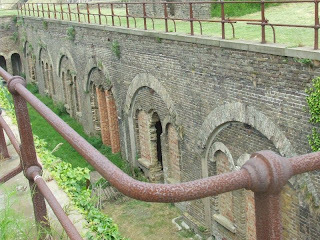 This should be fully restored and opened up, just like the Napoleonic Officers quarters at Dover castle. Superb building and needs investment. This is what the lottery money should be going on.